Kolak or Kolek is an Indonesian dessert made with palm sugar and coconut milk, with pandanus leaf (P. amaryllifolius) for flavour. In some versions, mung beans are also used, and cooked till soft. Banana may be added to this base, the dish then being known as kolek pisang (on the left photo). Left: Banana kolak, a variant of kolak. Pumpkin, sweet potato, jackfruit, plantain and/or cassava, and sometimes pearl tapioca may also be added. It is served either hot (especially if freshly cooked) or cold. Kolak is rather heavy and is usually eaten after the mid-day nap. Try the recipe of kolak with banana, sweet potatoes and tapioca (below). Whole Cloves - about 1 tsp. Put all ingredients into a saucepan. Use enough coconut milk to cover the plantains and yams well. Bring JUST to a boil - don't let it really boil, or coconut milk may curdle or separate. Turn heat down and simmer (little bubbles at edges of pan) uncovered. Stir occasionally to make sure coconut milk doesn't burn at the bottom of pan. Test the yams and plantains with a fork or knife for doneness after 1/2 hour. 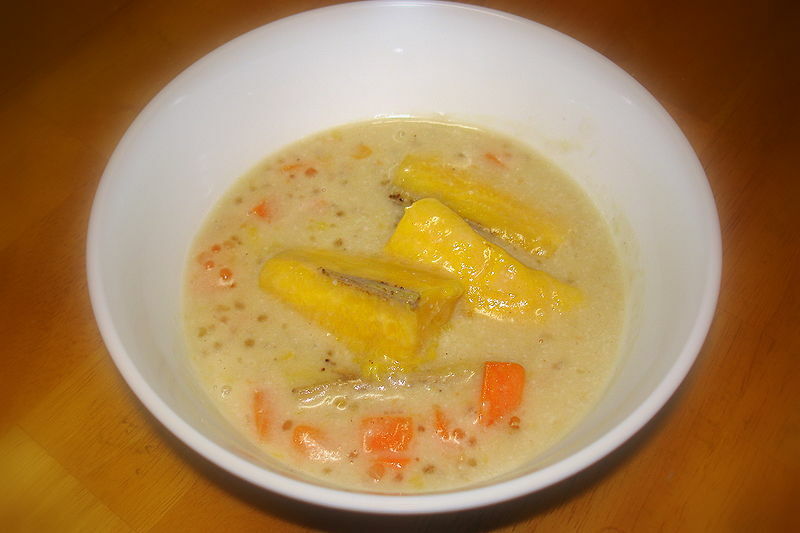 Cook until plantains and yams are tender, tapioca is transparent, and sauce is thick. Serve warm or at room temperature. Don't chill, as coconut milk may harden. Plantains are big starchy bananas that MUST be cooked. If you can't find them, use under-ripe bananas (still greenish). American sweet potatoes and American yams are really the same thing, just slightly different varieties, one being more orange, the other more yellow in color, with a very slight difference in taste. African and Asian yams are variety of starchy tubers with white flesh. When using real Southeast Asian tapioca/sago, you may need to cook it separately first until transparent before adding to the Kolak. If you can't find cans of frozen coconut milk at supermarkets or health food stores, try Indian shops that often have "concentrated coconut cream". Just dilute this with water to get coconut milk.